Power Maxed Racing and Arenacross (AX) have launched a sponsorship agreement which complements both the racing and car care product brand, and the FMX entertainment brand and their audiences. AX is an amalgamation of motocross and entertainment which can be likened to a petrol-fuelled Prodigy or Foo Fighters concert with a sprinkling of dare-devil Freestyle MX bike action. Taking place at several arenas around the UK throughout January and February 2018, it’s great fun for all the family. 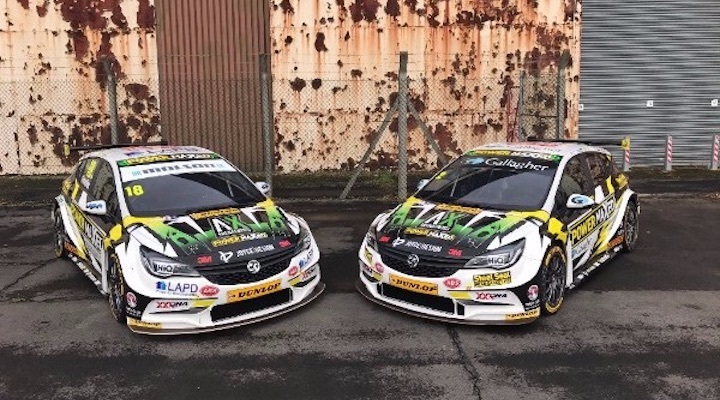 And Power Maxed is the brand new title sponsor of these events, creating a two-way relationship to bring AX to fans of the BTCC and vice-versa. The initial, and most obvious symbol of this new partnership is the almost reptilian look on the bonnets of both Astras for the final BTCC race weekend at Brands Hatch. This is for the final rounds only; AX will be sponsoring other areas of the cars for the 2018 season, leaving the prime space on the bonnets up for grabs by other sponsors. Secondly, AX will have a crowd-pulling, quite unconventional version of a photobooth near to Power Maxed’s trade stand, “Optimus”, where race attendees will not only be able to stock up on all their favourite Power Maxed products, but enter competitions to win tickets to AX events in 2018, and have their photograph taken in rather a mid-action pose on the FMX bike. Thirdly, there will be freestyle performances at some of the race weekends of the BTCC 2018 season, increasing the value-for-money even further than that usually offered by BTCC tickets. Tracks interested in hosting this Power Maxed AX spectacle, get in touch now and form an orderly queue. In turn, Power Maxed vehicle maintenance products will be used on the performing FMX bikes and available to buy not only at the BTCC 2018, but also the AX Tour 2018 too. “I’m really proud of this partnership, as it is benefiting both the BTCC and the world of Motocross by introducing each other’s fans to each other’s sports. The demographics are so similar; a family audience attracted by adrenalin-fuelled action and better-than-great value!” said Adam Weaver, Managing Director of Automotive Brands and Team Principal of Power Maxed Racing.